This Apache Server Setup process guides a user through creating an Apache server within a Windows environment. 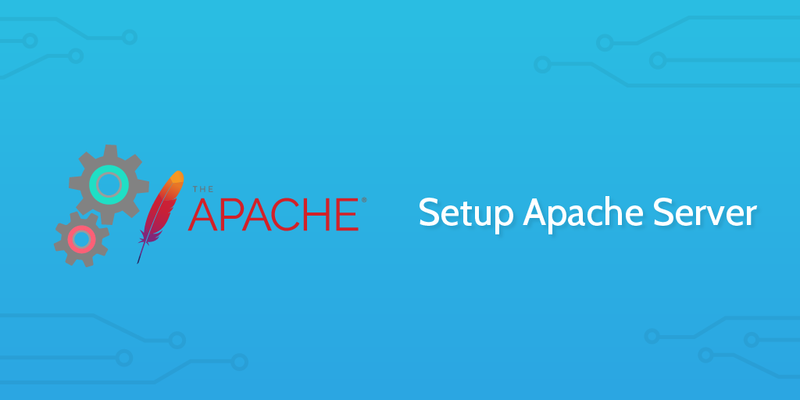 This Process Street Apache server setup process is engineered to take the user through the steps necessary to create a new Apache server on a Windows. The process does cater to other approaches with extra tips throughout. The Apache server has been the most popular web server on the internet since 1996 and is now 22 years old. It's reliability and open source nature has made it a mainstay within the tech world. This Process Street checklist provides a repeatable guide to setting one up and, being editable, allows for you to optimize the process relevant to your environment. There are form fields throughout the checklist where you can enter information. This information is then stored in the template overview tab and acts as an activity log, documenting what was set up, why it was set up, and how and where it was set up. This documented process is a useful part of maintaining activity communication across teams. All data is stored in a spreadsheet format and can be exported as a CSV file. Use the form fields below to record the details of the checklist. Who is going to be setting up the Apache server? For what purpose is the Apache server being set up? You can download Apache from ApacheLounge. Download either 32bit or 64bit depending on your server's system requirements. Record which version you have downloaded below. Make sure you have the relevant C++ Redistributable for Visual Studio installed on the server before you continue. You can find the extra resources on the ApacheLounge website on the link above. Open the downloaded "httpd-2.4.17-win64-VC14.zip" file and extract its content. The rest of this guide works on the premise that you have extracted to C:\Apache24, so save the contents there to make the rest of the steps easier. Use the form field below to record where you extracted the files to. Locate the file "httpd.conf" in the conf directory and open it in a text editor. If you extracted your file to C:/Apache24 you can move on to the next task. If you extracted your Apache file to D:\Apache you would be able to make the changes within this text file. ServerRoot "C:/Apache24" → ServerRoot "D:/Apache"
DocumentRoot "C:/Apache24/htdocs" → DocumentRoot "D:/Apache/htdocs"
ScriptAlias /cgi-bin/ "C:/Apache24/cgi-bin/" → ScriptAlias /cgi-bin/ "D:/Apache/cgi-bin/"
We need to instruct Apache that CGI/Perl scripts are allowed outside of the cgi-bin directory. To do this, we need to modify the http:conf file. This should allow the CGI/Perl scripts to operate as intended. We want Apache to take .cgi flies and .pl files and execute them rather than presenting them as text to a web browser. In order to do this, we need to find two lines of our code and simply uncomment them. Just take away the hash (#) at the beginning of the line to uncomment. The first line of .cgi/.pl files directs Apache to the install location of Perl. We want to change this so that the first line is ignored and the location of Perl is determined from the Windows Registry. Go to the location where you extracted Apache and enter into the bin folder. Hold down shift and right click in order to view your options. You should be presented with the option Open command window here. Depending on your settings, Windows may present you with a firewall warning. Continue through the window presented to you, allowing access to Apache as appropriate. In order to check your Apache server is running and your setup has been so far successful, keep the current command window open and open your web browser. If Apache is running correctly, it should tell you whether or not it is working. Use the form field below to record what Apache tells you. We need to make sure that Apache is running all the time. With our current setup, Apache is only running while the command box is open. In order to make sure it continues running we need to set Apache up as a Windows service. To do this is quite easy and requires only two short commands. This should then tell you that Apache2.4 was started successfully. 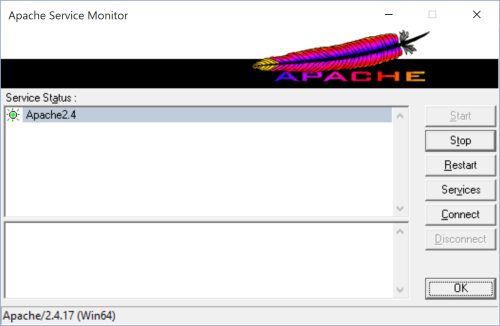 To make your life easier, Apache has included a small window within the package which helps you monitor the service. This will provide you with a quick and intuitive way of being able to stop, start, or restart the server at any time. Enter the bin folder as before and look for a file called ApacheMonitor.exe. Double click on this file to open the monitor and then create a shortcut for the monitor on your start menu or desktop for easy future access.